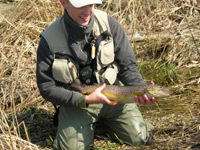 Notes: This pattern is one that came from Polish Fly Tier, Krystian Niemy. The pattern is fairly simple to tie and can be modified to represent many of our Sierran stoneflies. 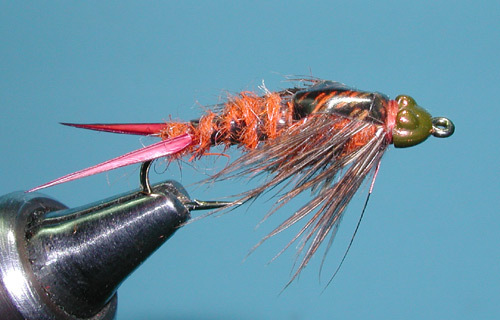 His original pattern can be seen on his own web site: Flies, Step by Step . I modified Krystian's pattern somewhat utilizing Goose Biots for the tail pieces, Thin Skin for the wingcase and abdomen ribbing, and utilizing a nymphhead bead. The basic tying procedure remains the same. One of the interesting aspects of this pattern is the use of Lead Tape for the underbody and structure. The abdomen has a thin taper but the thorax is built up with a downward taper similar to what you would see on a Stimulator. Incorporated into the thorax is a number of partridge fibers that stick out of the thorax like multiple legs or appendages. 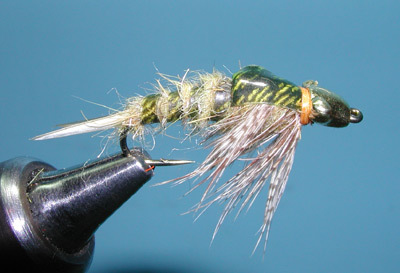 This pattern separates itself from many of the more rigid stonefly patterns with the flowing soft hackle that is placed in front of the thorax. The lead underbody actually has less weight than the wrapped wire that is incorporated within many patterns. This is going to allow for much more movement and flow. However, you may want to add additional weight with the use of a cone or bead just behind the hook eye. The pattern tied within the tutorial is meant to represent a Skwala nymph. The Skwala nymph is one of the early Spring stoneflies that appear on both sides of the Sierra. They have a mottled dark brown color looking similar to Salmonflies but much smaller. They are actually closely related to the LIttle Yellow Stoneflies. You will find these nymphs within the riffle water and rocky bottom runs of the Kern, Kings, Truckee, and Yuba rivers. Hatches will start as early as March.